AURORA, IL--(Marketwired - Apr 22, 2015) - BERNINA of America, the premier manufacturer of sewing, embroidery and quilting machines, presented Austin's Most Talented Designer, Chelsey Nordyke of Spire the Label, with a BERNINA 560 (B 560) during Austin Fashion Week in Austin, Texas last week. BERNINA recognized Chelsey during the Austin Fashion Awards FINALE, a celebration of local talent that took place Saturday, April 18 at the Austin Music Hall. The B 560 is valued at $3,399. "We are happy to recognize Chelsey with a Swiss-engineered BERNINA 560," said Amy Gutierrez, Director of Marketing for BERNINA of America. "The B 560 will enhance Chelsey's creativity and help her produce new collections with precision and ease. BERNINA appreciates quality fashion design and is proud to support the efforts of emerging designers who are the future of fashion and style." The BERNINA 560 (B 560) features a five-inch high-resolution color touch screen to navigate its wide range of features and functions. It has a simple yet classic design that sewists will appreciate, along with 700 total stitch patterns, an automatic thread cutter and a stitch width up to 9 mm. "I am so grateful for being recognized as Austin's Most Talented Designer and to receive a quality machine like the BERNINA 560," said Chelsey Nordyke, owner of Spire the Label. "While my Capsule Collection was created by my Sample Sewer in Chicago, I always dreamed of creating my next collection and now I can with my BERNINA 560. I have 250 sketches ready and waiting to be designed. It's crazy how things happen! I could have never planned it better." Chelsey is a 22-year-old Austin native who started her business, Spire the Label, in April 2014 after a year of hard work and self-funding as a full-time nanny. Chelsey discovered her passion for art when she was 13 years old and made her dream a reality. Designs from Spire the Label are minimalistic with clean lines that instill elegance, confidence, and a sense of edginess in each woman who wears Spire the Label garments. 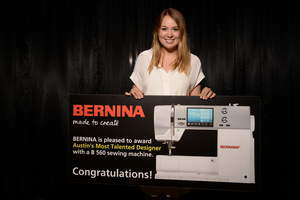 BERNINA of America recognized Austin’s Most Talented Designer, Chelsey Nordyke, with a BERNINA 560 during the Austin Fashion Show FINALE event on Saturday, April 18.